The Pod is a cosy couples getaway nestled by a creek with beautiful vistas looking over the Kiewa Valley to Mt Emu and Mt Bogong. The views can be enjoyed from the bed or whilst breakfasting on the sunny deck. The Pod is hand build by a talented local builder. It oozes character, charm and is cosy and warm in winter and cool in summer. It's architectural design enhances the beautiful feeling of luxury. Located in Upper Kiewa Valley, which is 30km from Bright and only a 30-minute drive from Falls Creek Ski Resort, with Hotham and Mt Buffalo near by. Indulge in local produce from spectacular restaurants, cafes and a unique local brewery - all within walking distance. Enjoy local activities such as horse riding, skiing, tobogganing, snow play, bushwalking, bike trails, scenic drives, wineries, fishing, high country tours and cattleman huts, paragliding, tennis, boating on the lake and lots more. Or curl up on the lounge with a book, relax in the beautiful bath, enjoy a movie or simply soak in the amazing views from the deck. For your convenience and enjoyment we supply: - linen, towels, bath salts, shampoo, conditioner, body cream, all from our local day spa, hair dryer, fully equipped kitchen, organic tea and coffee, Flat Screen TV/DVD, CD player, reverse cycle air conditioner, off road parking. A romantic luxurious, super clean and cosy pod awaits you. It is brand new so confirm your booking now, because we envisage it will book out very quickly. A very relaxing stay in a wonderful natural setting. The pod very cosy with some inspired design features that are sure to please. A lovely, romantic mountain getaway. 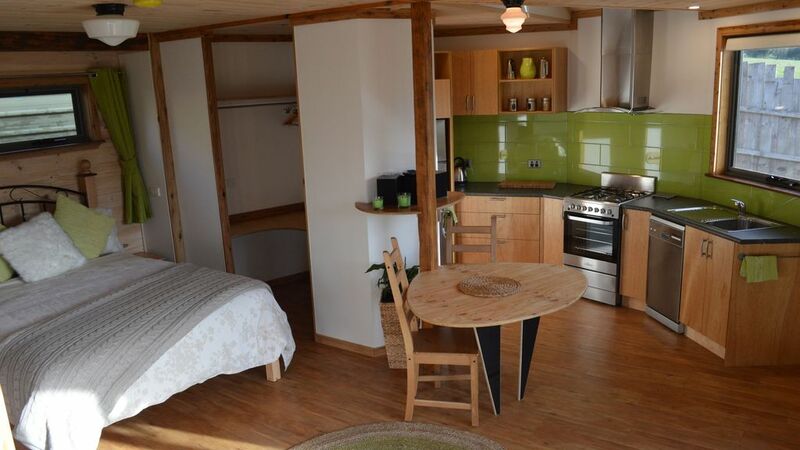 The Pod is a brilliantly designed and decorated bungalow with everything a couple could want. The mountain views and bird life are spectacular. Plenty to see and do in surrounding areas too. Walks around lake Guy, shopping in Mount Beauty, swimming at Tawonga Camping ground. We will be back. Clearly a great deal of thought went into the design of the Pod and everything in it. It is quite simply perfect. The views are amazing. A spectacular place in a beautiful part of the world. Thank you Sonja. We will definitely be back. Everything we needed and more. Clean, cosy, comfortable and stunning views. Absolutely gorgeous accommodation! Clean, homely, inviting, relaxing! Completely exceeding our expectations! Cosy little pod just for two!! We thoroughly enjoyed our stay at The Pod. The owner's attention to detail is fantastic. The Pod has everything you need - a very well equipped kitchen, wood heater and split system heating/cooling if you don't feel like lighting the fire. The bed is very comfortable. The location is really quiet and the scenery from inside, or sitting on the deck is lovely with uninterrupted views across the valley, Mount Bogong and surrounding hills. This is a beautiful little place if you want a cosy, comfy and relaxing break away. Even though The Pod is small, it is surprisingly spacious. Congratulations Sonja & Mark, we give The Pod a big thumbs up all round!